Product information "Lithoprotect® Seam Tape"
The seam tape YST520 is made of the same material as the self-adhesive UV protection foil YSA520. For this reason, all data and properties for the UV protective foil also apply to the seam tape. The yellow light products were specially developed for UV photo-sensitive applications and blocks UV radiation below 520 nm. The seam tape consists of yellow-dyed cellulose triacetate and is coated on one side with a permanent dispersion glue it can laminated on all solid surfaces. The laminated seam tape YST520 is waterproof and resistant to most oils and greases, gasoline and aliphatic hydrocarbons. The surface of the yellow film is partially dissolved or swollen by hydrochlorofluorocarbons, ketones or aromatic solvents, which can affect the optical properties. The laminated seam tape YST520 is self-extinguishing. Under proper storage conditions of 5 - 25 °C and a relative humidity of 30 - 60%, the seam tape has a shelf life of up to one year. The transmission characteristics of our seam tape are very close to our former yellow foil Y520, and were specially adapted to the stringent quality requirements in the area of the yellow rooms in photolithography and micro-electronics industry. The plot shown below is semi-logarithmic. At 450 nm wavelength, therefore, the transmission is close to the detection limit. 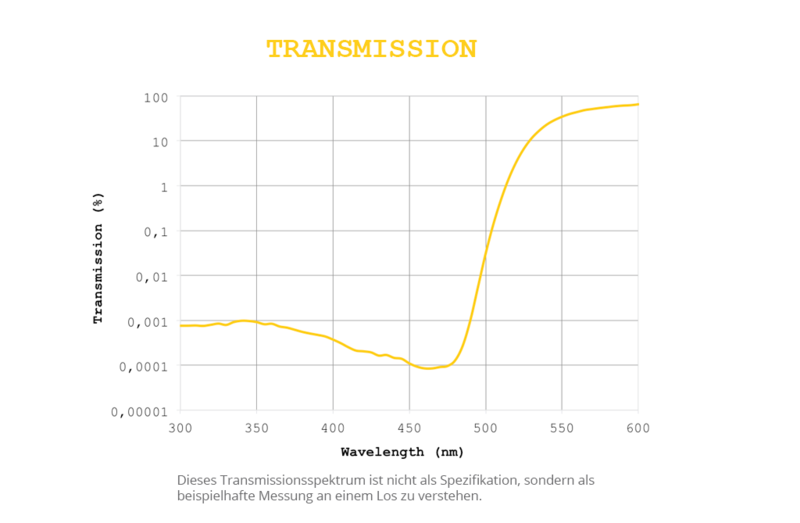 If you compare our film with other “yellow” foils, we recommend to ask for a semi-logarithmic transmission plot. If the surface to be covered with yellow foil is broader than the roll (which has a width of 115 cm), you can stitch two pieces of foil side by side and cover the abutting ends with our special seam tape. 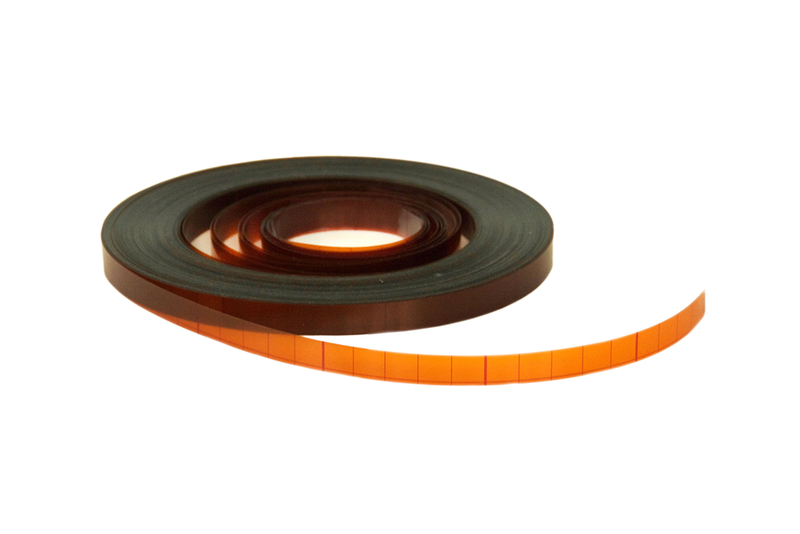 With the seam tape you can be sure, that no UV light will tunnel into your room. 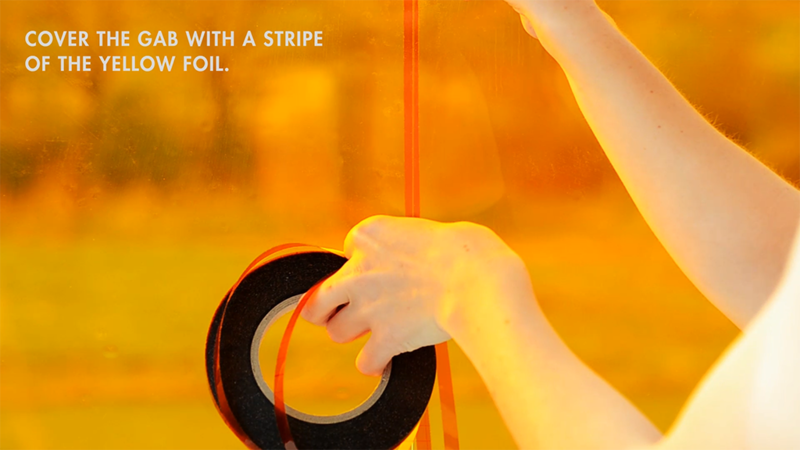 This seam tape you can use as well for covering the edges between the foil and the window frame. The yellow foil YSA520 can be glued with our mounting fluid DX MF 301 easily and bubble-free on any smooth and solid surfaces. 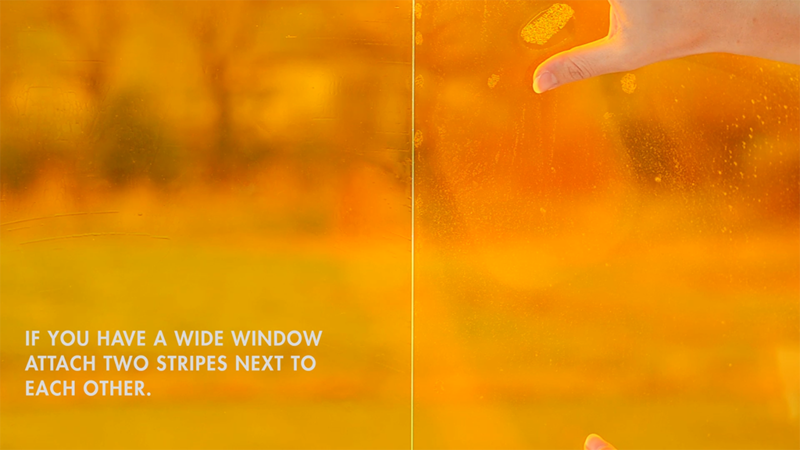 Detailed information is available in our assembly instructions for self-adhesive UV protection film yellow YSA520. For filtering fluorescent tubes, we recommend our specially designed polycarbonate sleeves. Here, our UV protective film Yellow Y520 is already incorporated, so you can cost-effectively “upgrade” standard white fluorescent tubes for your yellow light application . Download our installation instructions for the self-adhesive UV-protection foil or check out our tutorial. Customer evaluation for "Lithoprotect® Seam Tape"